QUOTATIONS: Quotations valid for 30 days. Clerical errors are subject to correction. PAYMENT TERMS: Net 30 days to accounts with approved credit. Credit cards and wire transfer's also accepted (wire transfer's are subject to additional $30.00 processing fee). MINIMUM BILLING: $50.00 net (U.S. dollars). FREIGHT: Freight cost to be borne by customer. FOB factory. Merchandise to be shipped UPS pre-pay & add unless customer instructs us otherwise (Fedex, DHL, TNT, freight collect, etc.). Shipments that are too heavy for UPS ground will be shipped via freight/truck using the customer's preferred carrier and billed collect. In all cases, handling charges apply. DELIVERY: Every effort will be made to fill orders within the time frame promised. We will assume no responsibility for the damages growing out of or owing to any delays due to material or labor shortages, accidents, fires, transportation delays, or any other factors within or beyond our control. CLAIMS: Under no circumstances will we be responsible for damages or claims for expense in using our products or services, including any damage caused by us or otherwise to customer supplied parts, products or molds. CANCELLATION: An order already entered with us cannot be cancelled without approval from management. Work already in progress may be charged to the customer even if the cancellation was approved. RETURNS: Any return must be made within 30 days of receipt of goods and only with approval from management. Stock products are subject to a 25% re-stocking charge. Custom products are not returnable unless deemed by us to be defective of material or workmanship in which case we will replace it without charge or extend full credit at our discretion. ART, NEGATIVES, PATTERNS, COMPUTER PROGRAMS, ETC. : All artwork, negatives, etc. 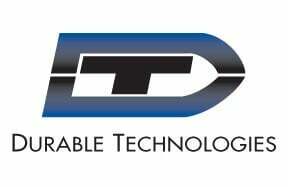 made by DT and used in DT's production process, even though in part or in whole were billed to the customer originally, remain the property of Durable Technologies. CUSTOMER INDEMNITY: By submission of an order, customer expressly represents and warrants that it is authorized by law to use the words, symbols, or art work connected with the order, and agrees to indemnify Durable Technologies against all claims and expenses, including attorney’s fees and costs, arising from any unauthorized use. WARRANTY: Warranty ensures products are to be free of defects in material or workmanship under normal use except normal wear and any alteration to product. No other warranty is expressed or implied.